Three Beetles in The Super Mario Bros. Super Show! Beetles are a species that appear in The Super Mario Bros. Super Show!. Beetles appear in the episode "Princess, I Shrunk the Mario Brothers", where they have a rather minor role. A quartet of Beetles are shown to be living inside a drainpipe that a shrunken Mario and Luigi take refuge inside of. As the Beetles are hungry, they chase Mario and Luigi through the drainpipe in an attempt to eat them, although Mario and Luigi manage to escape. 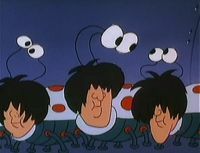 They resemble a cross between an insect and the British band, The Beatles. This page was last edited on February 14, 2018, at 13:51.